My son, feeding himself his breakfast like a boss in our Geelong dining room. Documenting your children’s milestones through photographs is perfect for creating a tangible record of your family history. It’s such a powerful way to tell the story of your child's life in a way that not only encourages a deep sense of self, but will also foster feelings of belonging and place as they grow. 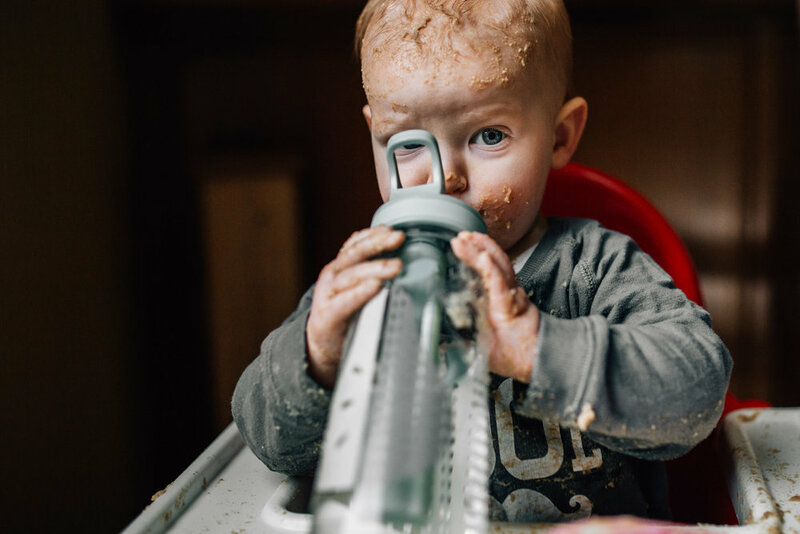 This morning my husband handed over the spoon so our son could feed himself his Weetbix for the first time, and as he did he reminded me to bring out the camera. I snapped away while my husband fried eggs, our son enjoying his breakfast all on his own. Seeing his face covered in an equal measure of cereal and pride, it hit me the true value in documenting these milestones. It isn’t necessarily for the event in and of itself, but rather to preserve something even more wonderful; a little something of who our children are, and who they’re becoming. I now have a record of his smile, the twinkle in his eye, the face he makes when he’s concentrating and (perhaps most precious to me) the way he plays peek-a-boo - spontaneously smacking his hands to his forehead and calling out with glee, not yet aware the game hinges on him covering his eyes. The milestone of our little son eating breakfast unaided was the cue to document, but it’s these wondrous little details I’m really recording. I feel so privileged that I get to document not only for my own tiny tribe, but that through storytelling and lifestyle photography I am able to make a record of the beautiful ordinary lives for so many families in the Geelong region. We are so fortunate to live in the mobile phone and smart technology era - it means it’s more convenient than ever to be our own history keepers. But in our busy lives where so often parents (and especially mothers) often don’t exist in photographs, it’s easy to forget how wonderful it is to have someone else document your milestones for you - in a way that is artful and honest, and that allows you to take your place as an important and pivotal part of the story. So grown up, right? Okay, I'm gonna cry. In the spirit of celebrating and documenting the everyday, I’ve compiled a list of first year milestones for the expectant parents among us. If you have a baby on the way, keep this list somewhere close - on your phone, or as a note on the fridge. Many of these moments tend to happen unexpectedly and without notice, so having a list might make us just that little more aware and likely to remember to take the picture. After all, the tiny triumph of a little human pulling up on all fours for the first time may one day be a treasure, something you’ll long to relive and pass on. This list contains many firsts. Don’t see it as an expectation to be ever camera ready, but rather a gentle reminder to be mindful, as well as present. There’s no need to capture the little firsts on the very first time - as a proud mamma you’ll probably want to just enjoy the moment with your little one. But some time over the week that follows, plan to find a time to document, if you can. 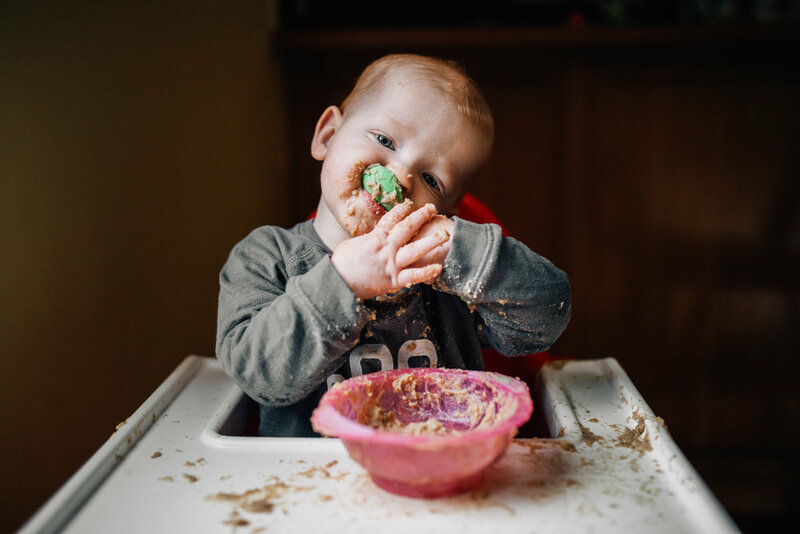 The image you make will become the place card in your mind - a visual cue to take you back over the days and the months and the years to the very moment your little one did that new thing for the first time. What a priceless gift to give yourself and your baby. So here are the First Year Milestones you'll want to document. Some of these you’ll be happy to capture on your phone, with quick snaps or video. For others you might bring out the camera, and for a few you may choose to hire a professional to create a stunning visual archive of memories for your family to treasure. Regardless of the way you decide to document, by the end of the year you will have photographs to print and enjoy. You may decide to fill a shoebox, compile an album, or decorate your walls. Whatever you do with them, they will become a precious record to help you recall the first fleeting year of your sweet darling’s beautiful ordinary life. Aaand a bath to wash all that Weetbix away! What family milestones do you have coming up? What would you do with them if you had beautiful family photographs taken to document this chapter of your family’s history? Would you display them on your walls to enjoy every day, in an album you can flip through with your children while snuggling on the sofa? Perhaps you’d leave them in a box, so your children could rifle through them and enjoy them daily.